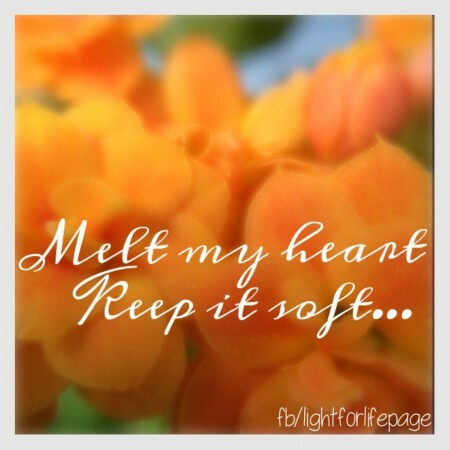 But one good thing is that God knows how to melt our hearts again and soften us and He has His ways at just the right time… Its good when it does happen and I hope and pray my heart remains pliable… I want it to stay melted, soft, and penetrable”. I actually wrote this a long long time ago but amazingly these revelations remain forever true and are always applicable in our lives, we will always encounter ‘heart hardening experiences’. Its something that I seem to have to fight against now and I know that I have become hardened in some ways but I think there must be a way to turn a heart hardening experience into a strengthening one rather than an obstacle. A soft heart doesn’t mean a weak heart in fact I’m sure it takes a lot more strength to remain soft. Featured, heart, life, love, obstacles, safe, soft, vulnerable. Bookmark.